Iron plays an important role in several essential bodily functions. It’s a crucial ingredient for haemoglobin, the substance found in red blood cells that carries oxygen around the body. Without oxygen, our organs and cells would not be able to respire; a process that keeps us alive! Although transport of oxygen is a principle function of iron, it is also a component of enzymes and helps with energy production. There are two types of iron; haem and non-haem. Haem sources of iron are found in meat and fish, and are more easily absorbed by the body than non-haem sources. For this reason, vegans and vegetarians should take extra care to include plenty of iron rich foods in their diet. See my post on ‘how to be a healthy veggie‘ for more information. 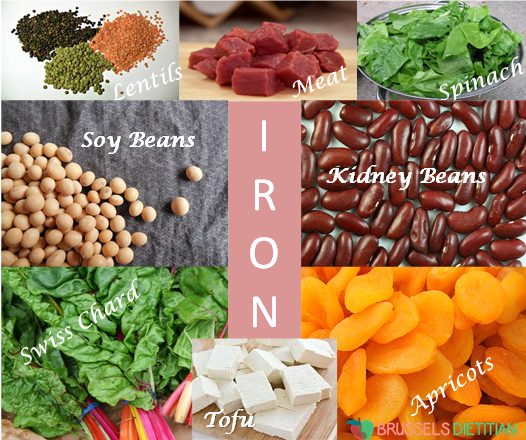 Foods containing high levels of iron include; meat (especially offal), fish, eggs, dark green vegetables (spinach, swiss chard, kale, bok choy), lentils, beans (kidney, black, chic peas), wholegrains, nuts and dried fruit. Some foods, such as soy bean products (milk, yoghurts and tofu), breakfast cereals and flour are fortified with iron. These can be a handy source, especially for fussy eaters, so check the labels of your favourites! A handy hint: Vitamin C can help our body absorb more iron. So by having a source of vitamin C alongside your meal, you’ll get the most iron you can from it. Good sources of vitamin C include; citrus fruits, peppers, broccoli and sweet potato. You should also avoid having tea and coffee at the same time as meals, as they contain phytates which bind with the iron and make it more difficult for the body to absorb. Iron reference nutrient intake gradually increases throughout childhood. The recommended daily intake for the adult population is 8.7mg for men and 14.8mg for women. Women have a higher requirement to allow for losses during menstruation (Department of Health, 1991). *Liver is not recommended during pregnancy due to its high vitamin A content. Iron deficiency anemia or IDA is one of the most common nutritional deficiencies in the world. It occurs when a lack of iron in the body results in a low number of red blood cells. IDA can result in the following symptoms; fatigue, breathlessness, insomnia, loss of appetite, decreased immunity, heart palpitations and a tingling sensation in your fingers and toes (paraesthesia). IDA is usually easily treated by taking a iron supplement which boosts the levels of iron in your body. Recurrence can then be prevented by ensuring a diet rich in good sources of iron. Some women who regularly have heavy periods may need to take an iron supplement, ask your doctor for more advice. Too much iron usually occurs through use of a supplement but can lead to constipation, nausea, vomiting, and stomach pain. Intakes of less than 20mg are unlikely to cause any problems, but very high doses can be fatal, so be sure to keep iron supplements out of reach of children.